"The steak is cooked with condensed tomato soup mixed with cream of mushroom soup. Dry onion soup mix is sprinkled over the top. Easy by any standard." 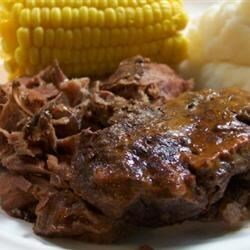 Place meat in the bottom of the slow cooker; if necessary, slice meat to make it fit! In a medium bowl, mix together mushroom and tomato soup. Pour mixture over beef. Sprinkle dry onion soup mix over top. Cover, and cook on Low for 8 to 10 hours. Very good. I put in my flank steak partially frozen and cooked it on low 8 hours; also used low sodium mushroom and tomato soup. Will make again!